What, pray tell, is an “Obatza?” Well, my dear friends, it is classic Bavarian Bier Garten food! Or, Beer Garden food. And so good! It’s not an appetizer, nor a meal, nor a dessert, but a cheesy, creamy, bowl of lusciousness designed to pair with your favorite cold beer whether outdoors in the summer Bavarian Blue sunshine or seated around the wood stove in winter. Picture your family and friends gathered around a large solid wood table complete with big liter steins of beer. Talking and laughing the afternoon or evening away and you have the perfect setting for serving Obatza. Though made to go with beer, you can enjoy it with your favorite cold beverage like ice tea, or lemon lime soda. I guarantee you that it is on the menu at every beer garden in Bavaria and it varies little from place to place. It is served with crisp thin sliced red onion, radishes, heavy dark rye bread and of course, the famous big soft Bavarian Brezn or as we know them, pretzels! It’s a “Brezn” ( haha) to make using just a handful of ingredients. 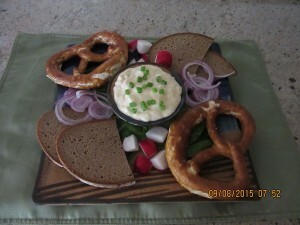 With Octoberfest right around the corner, why not serve your guests an original beer garden treat? I’m sure you will love it! Serves 8 people as a hearty snack. Needs to refrigerate overnight. ½ lb Camembert Cheese, rind and all, at room temperature so it’s soft. My room temperature was 92. It was a very hot day….ugh! 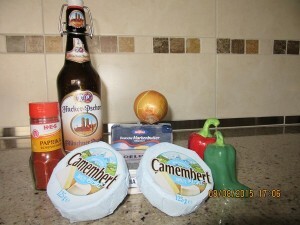 Place softened Camembert in a mixing bowl and righteously SMOOSH it. It will take a little elbow grease. 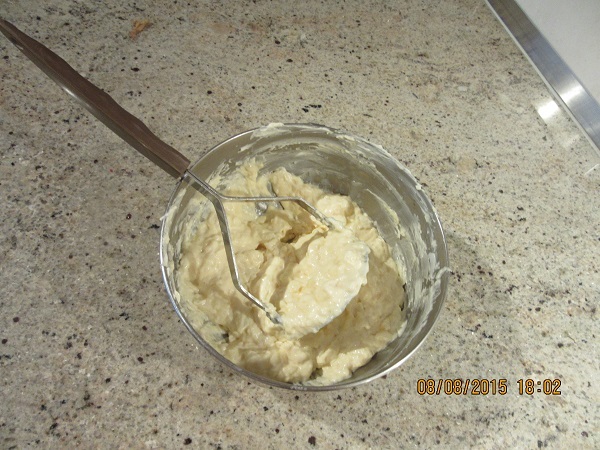 I found using my old hand potato masher utensil worked well. Keep working it until it is smooshed, soft, creamy but still has chunks of cheese present. We’re after the correct texture here. Add the butter and keep working it until combined. 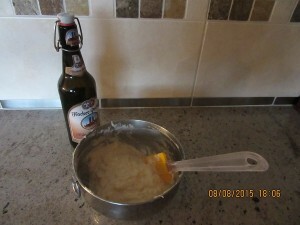 Then add the softened cream cheese, onions, salt, paprika and beer. Switch over to a rubber Spatula and mix until well combined, scrapping the bowl as you go. Cover and refrigerate over night to firm up and let the flavors meld together. You won’t be sorry! Should look like this. Mound the Obatza into a pretty bowl and place on a platter. Sprinkle the Obatza with minced chives. 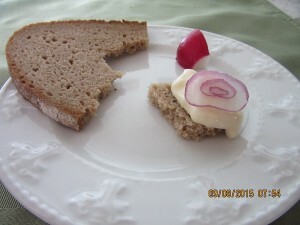 Surround the cheese with slices of dark bread, radishes, thinly sliced red onion and the pretzels. Tear off pieces of the bread, add a dab of Obatza a little onion or radish and Bob’s your uncle, you’re in Bavaria. Prost!